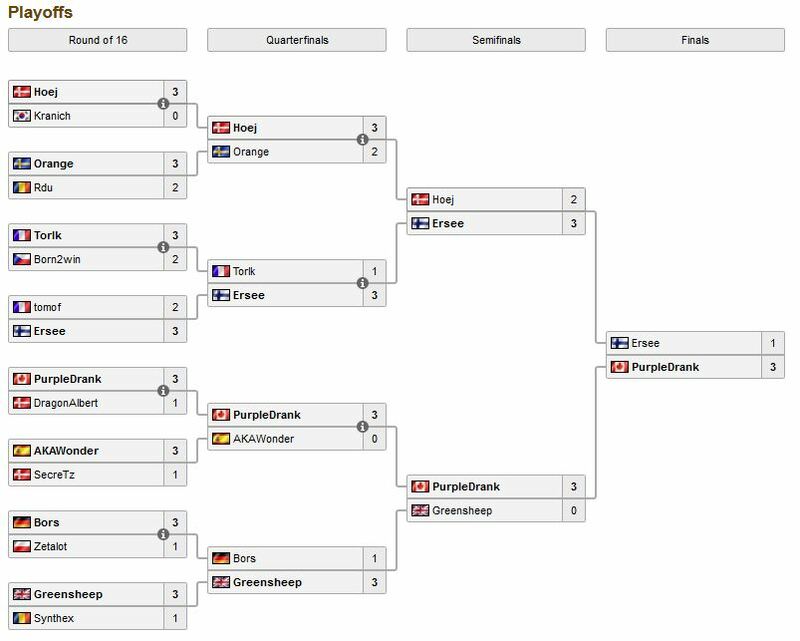 Yesterday one of the biggest Hearthstone events of the year finished with the Dreamhack Winter 2015 tournament in Jonkoping, Sweden. 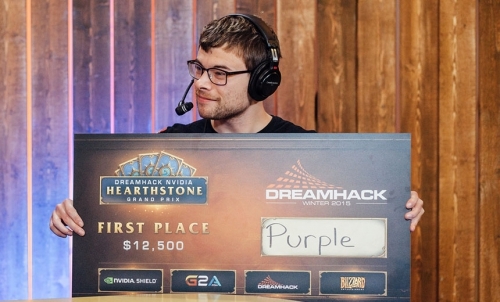 Find out who took home their share of the $40,000 and 50 Hearthstone World Championship points! The format was Last Hero Standing, meaning the winning player continues to use the same class and deck while the losing player is forced to change decks. The massive field of 200 players was narrowed down to the top 16 after 9 grueling rounds of swiss play for a single elimination bracket style finish. NA Champion PurpleDrank cruised through the group stages going 8-1 and his road through to the finals was similarly smooth, sweeping both AKAWonder and Greensheep 3-0 and taking the victory against DragonAlbert 3-1. On the other side of the bracket Ersee from team Manalight had a much tougher road. He went 7-2 in the group stage to qualify as the #12 spot and then had 2 series go to all 5 games against tomof and Hoej from team Natus Vincere. This set up a David and Goliath scenario with PurpleDrank, NA champion and clear favorite up against the newcomer Ersee on a new team Manalight. The first match featured Ersee’s control Warrior up against Purple’s Druid. Purple maintained an early advantage getting early board control. An early Ancient of Lore kept up the tempo for Purple and he was eventually able to seal the deal on turn 8 with a Force of Nature Savage Roar combo with 2 other minions on the board as well. In game 2 Purple’s Druid this time had to go up against Ersee’s Paladin deck. Purple had terrible draws getting nothing but spells in hand until turn 7 so Ersee was able to maintain early pressure with the help of the new Keeper of Uldaman card and picked up the win soon after to tie up the series at one game apiece. Next Purple switched to his Warrior deck to try to defeat Ersee’s mid-range Paladin. Purple grabbed the early advantage forcing Ersee to deal with a Frothing Berserker that was quickly getting out of control. With no good plays in hand Ersee showed both of his Peacekeepers early which left the door open for Purple to drop his Dr. Boom. After getting ridiculous value out of his Loatheb Purple closed out the game with a heads-up play executing the Lightwell that dropped from Ersee’s Shredder that set up lethal from Grommash on the following turn. In the final match, Ersee’s Warlock deck was his last chance to stay alive. While running an interesting mix of cards Ersee wrested early control of the board from Purple with a Sludge Belcher and a Twilight Drake. In another brilliant move, Purple chose to clear his Death’s Bite with a Fiery War Axe wasting one charge of the weapon but allowing him to develop 4 Patrons on the board which forced Ersee to Power Overwhelming + Shadowflame to clear them. At a bit of a standstill Purple finally played his Battle Rage to grab 3 cards and take a bit of momentum back. Sitting on an Inner Rage and a 1 charge Death’s Bite, Purple only needed Grommash to win and after a few nerve-wracking turns he finally drew it to charge in and take the victory! Congratulations to Purple and Ersee for their incredible finishes. The win lands Purple firmly in the lead for Hearthstone World Championship Points for next year and bumps his lifetime earnings to $28,250. 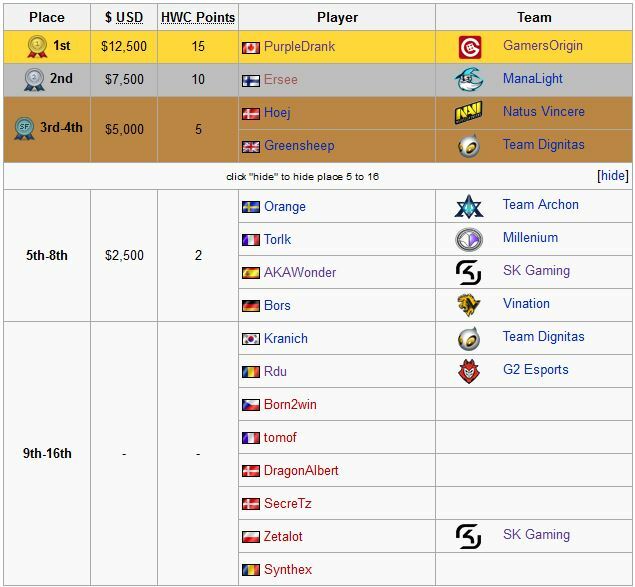 Meanwhile Ersee earned $7,500 for himself in the first major tournament placing of his career.